Terminator can be expanded using plugins. Additional features can be created outside of the main application, and added in at runtime. In theory you should be able to implement fairly powerful plugins, although so far the included ones we have are fairly small in scope. create handlers for strings that match a pattern. Several of the included plugins create Click-able items in the terminal. These are highlighted by underlining the item when the mouse hovers over it. The following plugins are distributed by default with Terminator. Unless otherwise stated, the included plugins are under the Licensing as Terminator, GNU GPL v2. Adds a menu item, Watch for activity, to The Context Menu which will create a notification, as seen to the right, when there is output to the terminal. This is useful when you have a long running command and wish to know when it has completed, or output an update. How long in seconds until the next notification of activity is presented. There is currently no way to edit these options in the GUI, it must be done directly in The Config file. Which would wait 30 seconds before showing another notification of activity. Bear in mind also that your notification may look very different to the image shown due to theming. Text matching apt:. * will be converted into a click-able item that when triggered with Ctrl+click will launch the default package manager for software on a debian system. Adds a menu item, Custom Commands, to The Context Menu which has a sub-menu containing its own Preferences item that launches the window show below. Below that is a list of user configured commands that can be chosen. In this window you can create a New item, and Edit or Delete existing ones. The selected item can be repositioned in the sub-menu order using the Top, Up, Down and Last buttons. Clicking New or Edit gives the smaller window. An Enabled item is shown in sub-menu, and a disabled one is not. The Name is used for the sub-menu item text. 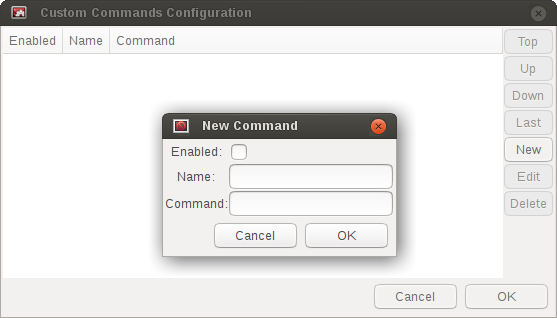 The Command is the text that will be entered into the current terminal with a Return at the end to execute/enter it. You do not get a chance to edit the text first. A rudimentary support for sub-trees is implemented. Simply add one or more / in the Name field, and the tree structure will be created. Positioning is determined by the first time a sub-tree is referenced, so a later reference will be attached to the sub-tree defined by an earlier reference. If other terminals are receiving, they too will receive and execute the Command. Adds a menu item, Watch for silence, to The Context Menu which will create a notification, as seen to the right, when a terminal has been quiet for a given period. This is useful when you have a long running process that outputs constantly (i.e. compiling a kernel) and you wish to know when it has ended. This notification will only show once, unless there is some activity in the terminal after the initial notification. How long in seconds until a terminal is considered inactive. How long in milliseconds between checks for inactivity. Be aware that this combination will result in some uncertainty as to the exact timing of the notification. In the worst case, with the values given, the notification may take 14.9 seconds to appear. Which would check every second if the terminal had been silent for 30 seconds. Text matching lp: #12345 where 12345 is a bug number in launchpad, will be converted into a click-able item that when triggered with Ctrl+click will launch a browser to the bug report in launchpad. Additionally the plugin will accept variants where the prefix is in capitals, i.e. LP, and the :, white-space, and # are optional. Ctrl+click on this will open four pages; one for each bug number. Additionally the plugin will accept variants where the prefix is in capitals, i.e. LP. Adds a menu item, Start Logger, to The Context Menu which will popup a window for selecting a file name to save as. Any content then written to the terminal will be written to the file too. Once started the menu item will change to Stop Logger which does precisely what you would expect. There appears to be problems when applications switch to/from alternate mode (i.e. vi, mc, etc.) The obvious one is that the alternate screen is not “logged” although it is not clear how this could be logged. The second issue is that some of the output after the alternate screen is not logged. See LP#1477386 for more info and progress. Maven plugin handler. If the name of a Maven plugin is detected, it is turned into a link to its documentation site. If a Maven plugin goal is detected, the link points to the particular goal page. Only Apache (org.apache.maven.plugins) and Codehaus (org.codehaus.mojo) plugins are supported. Adds a menu item, Terminal screenshot, to The Context Menu that will take a screenshot of the underlying terminal, and present a dialog for where to save it. An almost comically stripped down example. As I find (or I’m told about) plugins that are available elsewhere, I’ll add links here. I’ve done a preliminary search, and.. Wow! I never knew there were so many out there. If any of the authors would like to get their plugins added to the main Terminator package, or they would prefer not to be listed here for some reason, they can reach out to me through the project site on Launchpad and we can sort it out. I have done no testing or checking of these plugins. You use at your own risk, and you are responsible for evaluating the code for bugs, issues, and security. While we have ensured the included plugins have received the required changes to function with GTK3, the third party plugins are not under our control. Examine the change logs of the respective plugin and look for commits that mention GTK3 updates. ssh_menu: I’m guessing a bit, but I think it works with SSH Menu ;-) the code is quite big to understand at a glance. clisnips: Snippets for the command line. hostWatch: Attempts to figure out your current host, and apply a certain theme. dump_to_file: Dump console contents to a text file. show_titlebar: Menu item to show/hide the titlebar. k8s: NEW! Work in progress, with the ultimate goal to provide k8s specific informations in the shell title bar. This will need root permissions to do. The optional local/ is usually for packages installed by hand, rather than through the package manager, and this depends on how Terminator was installed on your system. This allows you to use plugins without needing root. The following guide is initially sourced from a tutorial written by Chris Jones back in April 2010. I’m reproducing it here as a precaution, although I don’t expect the original will disappear. It will get rewritten and expanded as more knowledge and information is added. One of the features of the new 0.9x series of Terminator releases that hasn’t had a huge amount of announcement/discussion yet is the plugin system. I’ve posted previously about the decisions that went into the design of the plugin framework, but I figured now would be a good time to look at how to actually take advantage of it. While the plugin system is really generic, so far there are only two points in the Terminator code that actually look for plugins - the Terminal context menu and the default URL opening code. If you find you’d like to write a plugin that interacts with a different part of Terminator, please let me know, I’d love to see some clever uses of plugins and I definitely want to expand the number of points that plugins can hook into. A plugin is a class in a .py file in terminatorlib/plugins or ~/.config/terminator/plugins, but not all classes are automatically treated as plugins. Terminator will examine each of the .py files it finds for a list called available and it will load each of the classes mentioned therein. Additionally, it would be a good idea to import terminatorlib.plugin as that contains the base classes that other plugins should be derived from. So now let’s move on to the simplest type of plugin currently available in Terminator, a URL handler. inherit from plugin.URLHandler if you want to handle URLs. Terminator will call a method in your class called callback() and pass it the text that was matched. You must return a valid URL which will probably be based on this text. And that’s all there is to it really. Next time you start terminator you should find the pattern you added gets handled as a URL! Regarding the configuration storage API - the value returned by Config.plugin_get_config() is just a dict, it’s whatever is currently configured for your plugin’s name in the Terminator config file. There’s no validation of this data, so you should pay attention to it containing valid data. You can then set whatever you want in this dict and pass it to Config().plugin_set_config() with the name of your class and then call Config().save() to flush this out to disk (I recommend that you be quite liberal about calling save()).